Frank Thomas – In Pursuit of "The Big Hurt"
As physically imposing as Frank Thomas was, somehow this gentle giant managed to amass huge numbers in a relatively quiet manner during his career. As a reward, this generally well-liked slugger received enough votes to guarantee enshrinement later this year during the festive weekend in Cooperstown. Thomas, who has appeared on some of the hobby’s most popular and significant modern trading cards like the 1990 Leaf and 1990 No Name on Front (NNOF) rarity, remains a fan favorite. In the following article, we take an in-depth look at this Chicago superstar and his cards. The 1986 Topps Football Card Set – Is this Green-Bordered Set the Best Football Set of the 1980s? In the post-1980 era, there are not too many football cards sets that can compete with the popularity and difficulty of the 1986 Topps issue. Anchored by two of the most significant rookie cards in football history in receiving legend Jerry Rice and quarterback Steve Young, this green-bordered set is susceptible to chipping, making PSA Gem Mint 10 copies a real chore to find. With 396 total cards needed to complete this great set, collectors have their work cut out for them if they intend on building an extreme high-grade set. In the next article, we discuss this set with the hobbyists who find it so appealing. When it comes to player sets, there is no question that the Master sets pose a much greater challenge than the Basic sets. Not only do they contain a much greater volume of cards, they also tend to require cards that are much tougher to find in any grade. This makes it very tough to complete these sets. This award-winning set, in the vintage category, is the only Yogi Berra player set to ever reach 100% completion. With a GPA of 7.25, it is also a high-grade collection. Beyond all the key Berra cards, like his 1948 Bowman rookie and his 1952 Topps classic, this 112-card set contains all the tough regional Berra cards and scarcities. They include cards like his 1951 Topps Major League All-Stars issue and a variety of regional/food-issue cards like Drakes, Red Man Tobacco and Post Cereal cards. It also contains all the coins, pins and stamps that contained Berra’s image. This set is a great tribute to the man who won more World Series championships (10) than any player in baseball history. Click here for a glimpse of this set. HURRY! Set Registry Special ends 1/31! Clean Sweep’s Auction: Now Open for Bidding. Ends Wednesday, January 29. Clean Sweep opens 2014 with one of our biggest, best and most balanced auctions. The auction opens with an amazing baseball signed by none other than Shoeless Joe Jackson and Buck Weaver. Goodwin & Co. is proud to announce a significant and historic find of bread and tobacco cards produced in Louisiana during the beginning of the previous century. 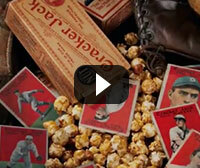 One of the most important cards in this find is a Holsum Bread card of Babe Ruth. This is the only known copy to date! Love of the Game Auctions current sale features sports cards and memorabilia from the late 19th Century to the present, highlighted by a beautiful 1946 Babe Ruth signed baseball, a gorgeous, high grade 1908 E102 Honus Wagner, a beautiful group of unopened football card packs from the 1950s, and a fantastic assortment of autographs and memorabilia. Throughout our long history in the hobby, Goodwin & Company has been privileged to offer some of the most exquisite treasures in all of sports collecting. Yet, when the phone rings and someone contacts us with never-before-seen relics from baseball’s past, our hearts quicken and excitement grows. Just such a story happened recently, with what we call the Holsum Bread Find. A Rare Honus Wagner Baseball Card Fetches $657,250, the Jersey Worn by Christian Laettner when he Hit the Iconic Buzzer-Beating Basket Against Kentucky in the 1992 NCAA Tournament Brings in $119,500 and the Original Street Sign from the Brooklyn Dodgers' Ebbets Field Garners $58,852. Jackie Robinson’s 1947 Rookie of the Year Award with a letter from his widow, Rachel, sold for $401,968 at the Lelands.com Fall 2013 Catalog Auction on Jan. 10. The trophy, which Robinson won for the season during which he broke baseball’s color barrier, was sold to an anonymous buyer. Giovanni Sports Auctions is excited to announce the launch of its new site www.giovannisportsauctions.com. 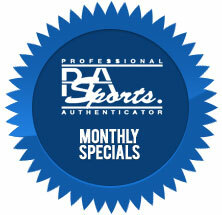 The Inaugural Auction is now open for bidding on many PSA and PSA/DNA items. This is your chance to bid on such items as a 1954 Topps Hank Aaron Rookie, Ty Cobb signature, Jimmie Foxx signature among the hundreds of lots in its exciting kickoff auction! Whose career and perceived value will be impacted the most from a Super Bowl victory?